The Maribyrnong and Yarra River are intriguing fishing destinations along Melbourne’s doorstep. These river systems are not much to look often quite crowded, discoloured water and full of litter. However their true beauty is hidden in the abundance of healthy bream in which they hold. I have fished both these river systems for many years and have developed some proven techniques to improve your catch rate. 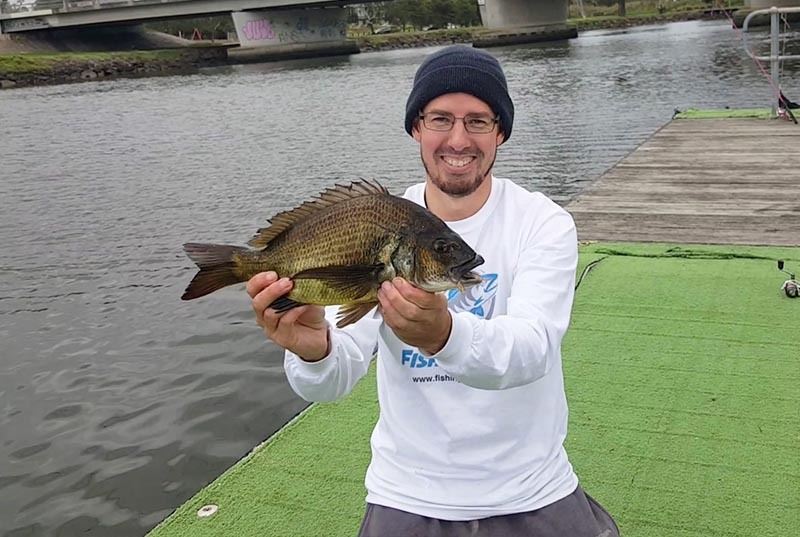 Bream are an iconic species of Melbourne that can be targeted all year round. They will take a variety of baits. Seasonally they move around, during winter seeking deeper water and in summer reside in the shallows along the banks and edges. They are active on sundown and sunrise and during peak tide changes. Bream love structure and will seek shelter in shade, submerged trees, boat ramps, bridges, jetties, and pylons. Here is our detailed guide that will help improve your catch rates when fishing these 2 river systems. Bream will happily take a wide variety of baits. Including scrub worms, maggots, yabbies, tube worms, pilchard strips, peeled prawns, raw chicken, bread, mullet gut, whitebait, mussels & pipis. However I have had the most success with scrub worms, maggots, yabbies & sand worms. Fishing for them at night with bait can be challenging. I have found that baits with scent and movement such as live yabbies to be more productive during the dark. These baits are widely available from tackle stores around Melbourne. Include BCF, Hooked on bait and tackle, Trelly’s tackle world, Compleat Angler, Noel Clarke’s tackle bar, vTackle, CSC Fishing & Boating or buying online from A1baits and Spikebait. The first thing you’re going to need is a suitable fishing rod combo. Weight and size are key for bream fishing and generally light spinning gear will work well. A suitable fishing rod length should be between 6.6 foot through to 8 foot. The most suitable weight classes are 1–3 or 2–4 kilo rods. Anything heavier just isn’t suitable for this style of fishing which requires finesse. Coupled with a 1000, 2000 or 2500 size reel. For beginners there are plenty of quality entry level rod combos that wont break the bank. Some good examples include the affordable Savage Gear MPP2 and 2000 black reel combo. There is also the ever reliable Shimano Catana rod series such as the 702 estuary series Rod 2-4 kilo coupled with a Sienna 2500 reel. These are ideal choices when starting available with price points around $129 at most local tackle shops. As your become more accomplished you will likely want to upgrade your rod combo. The options here are almost endless. Some recommended options include the Abu Garcia Veritas 3.0 702SPL 7 foot rod 2-4 class. Coupled with a ProMax 30 spinning reel is great and wont break the bank at a price around $229. Then Shimanos revolution series rods and reels such as Stadic, Nasci, Sedona at different price points. There are also popular spin rods such as the Daiwa gen black series. My current bream combo is a Savage Gear Finezze spin rod 2-4 kilo paired with a Stealth 2000 reel. Now that you have purchased a suitable rod combo its time to spool your reel with fishing line. If you were using lures then we would highly recommend using a light quality braid. However this article is focusing on bait fishing so we recommend a quality 4 or 6 pound monofilament line. Monofilament is very affordable so aim choose a decent quality one which will have thinner diameter and less prone to wind knots. Its then time for a leader. Fluorocarbon leader is a fishing line which you place at the end of your rig that’s been fused to make it thinner and harder for fish to see in the water. This is a real advantage when fishing for bream which are clever and easily spooked. From the main line, I run roughly 50cm of 4 pound fluorocarbon leader. There are many brands of line on the market so don’t be afraid to ask your tackle shop for some advice that fit within your budget. Remember to keep the drag on your reel set loose which will allow the bream to run with the bait without feeling an unnatural resistance. This will encourage more bites and allow better hook-ups. You can then tighten your reel once you on and have set the hook. I have experimented with many different fishing rig setups however I have 3 rigs that have proven to continually produce bream which are very easy to setup. Spool the main line with 4 pound monofilament ( main line shown in blue ), then join a leader directly to the main line ( leader shown in grey ). A simple double uni knot will work well here. The leader should be roughly 45cm in length of 4 pound fluorocarbon leader to a size 4 long shank bait keeper hook. This method is ideal when fishing unweighted live yabbies or packet prawns. Berley plays an important role when fishing for bream to firstly attract them into the immediate area, encourage them into an aggressive mood and then to keep them hanging around. You can purchase pre made berley from your local tackle shop such as Ultrabite or make your own Berley by mixing simple ingredients such as Tuna oil, chicken pellets, bread crumbs, pilchard, wheat and, bread. One simple method is to keep bread in a bucket of water and continually throw some out in an isolated area. There are many productive spots all along the Nong and Yarra that can produce quality bream all year round. Spots that you should try include the Footscray Buddhist temple, Dynon road bridge, Lynches bridge, under the West Gate bridge, Crown Casino entrance, Bolte Bridge, Pipemakers Park, Flemington racecourse, behind the anglers tavern, Canning reserve, edge water estate, Riverside park pirate ship playground, old explosives factory, Essendon rowing club near the visible drains, around Highpoint shopping center. In fact, the whole stretch of river can fish well on its day so be prepared to just simply walk the banks and cover new ground. In warmer months with polarized sunglasses and see Bream sitting along the edges. We have detailed over 125 fishing locations to fish around Melbourne and Victoria see make sure you check that out. Catch and Release or eating from these areas? It would be very questionable to eat bream from certain parts of the Maribyrnong river and Yarra river. This is due to water contamination and wash off from areas such as the Flemington racecourse. There has also been recent chemical spills and areas with high concentration of rubbish. Bream will move up and down the water columns but resident bream are very prone to these water conditions. Its completely a personal preference with no right or wrong answer. Personally I highly recommend catch and release fishing for bream where possible in these areas. I just enjoy the sport of catching bream on light gear. I enjoy watching bream swim away especially when fishing with my kids. I continually see anglers using tackle that’s too heavy for bream fishing. Large sinkers, large hooks, and heavy line is by far the most common mistakes. Bream are an intelligent fish that will often play with the bait before taking the hook if they feel resistance they simply won’t take the bait and will instead move on. Bream are easily spooked so thick line, and big gear will spook them quickly. I am amazed how many time I see people fishing with large snapper sinkers, large hooks and, heavy 20 plus pound line. I often see people using long heavy fishing rods that are more designed for chasing fish such as snapper and gummy sharks or for surf fishing for salmon. When targeting bream you need a rod that is light and sensitive with a heavy rod you may be getting bites and be completely unaware. Share your ideas and feedback with us by emailing reports@fishingmad.com.au or contacting us on our Facebook Page. 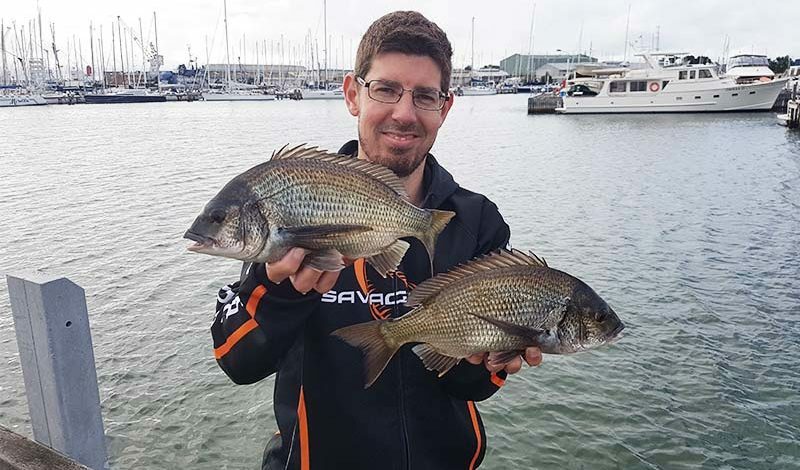 Make sure you send us pics of you fishing for and catching Bream on the Nong we would love to add them to this article.